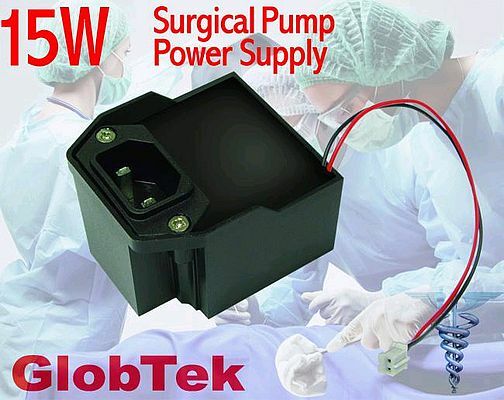 Capable of serving multiple device applications, this medically approved 15 W power supply from GlobTek operates as the backbone power for a rack-oriented modular infusion-pump system. Featuring a leakage current of <100µA, it accepts a voltage from 90 to 264 Vac at an input frequency from 47 to 63Hz and delivers an output of 12Vdc at 1.25A with no minimum load required to maintain output voltage regulation. The modular system may be using anywhere from one to four pump heads, and sometimes may not have any load present at all. The IPX-rated medical power supply has an output load regulation of ±5% and a typical line voltage regulation of ±1%. The turn-on/turn-off overshoot is 5% maximum, typical recovery time for a 25% step load being 1ms with a hold-up time of 8ms at nominal voltage and full load. The dielectric withstand voltage is >5.5kV from primary to secondary. Able to operate at a high altitude, the switching power supply is potted for wet-area applications. It meets EN60601-1:2006 Part I, 3rd Edition and complies with EN55011 class B and FCC Part 15 Class B as well as EN60601-1-2:2007 Part 1-2. Additional features include overvoltage and short-circuit protection.